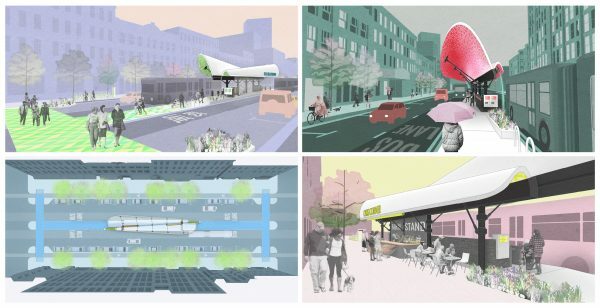 Utile’s entry in the BostonBRT Station Design Competition is now open for public voting! The competition, hosted by the Barr Foundation, called upon designers for creative and inspiring visions for future Bus Rapid Transit (BRT) stations that inspire, create a sense of civic pride, and deliver a world-class transit experience to Bostonians. More information about the competition is available on the Barr Foundation blog post, Twelve Designs Reimagine the Boston Bus Stop. Utile’s vision, “The Billow,” is the product of a think tank of urban designers, transportation planners, and architects, named for its sculptural and weightless form. Intriguing yet timeless design, BRT-rider comfort, and seamless integration into the city streetscape were all factors in the visioning process. If you’d like to vote for our design, please “like” our entry on Facebook. Each “like” that our image receives will increase our chance of winning the public voting portion of the competition.